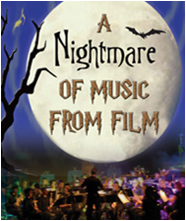 Last night my family and I visited Citrus College Performing Arts Center to see A Nightmare of Music from Film. This student annual performance featured chilling and suspenseful film scores played by the Citrus Sierra Wind Symphony and sung by the Citrus Choir. Synchronized perfectly to film projections of each movie, we were at the edge of our seats as we listened and witnessed the horrors of great frightening classics! Go see it next year for a thrilling night!